It really doesn’t seem that long ago when my daughter was so in love with Mark Hamill, and of course, I was in love with George Harrison. 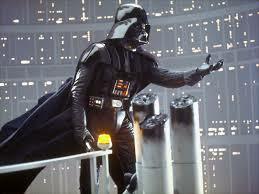 Today Star Wars is just….LOUD. over and over again online….so you know that next movie will be watched! WHat a homage to “Star Wars”! Brought back so many fond memories. May the 4th be with you, Donna! I wonder what Disney will do to it……will it actually be good or will it be to the first 6 what My Immortal is to Harry Potter? I haven’t been very excitied by JJ Abrams’s take on Star Trek, so I’m cautiously looking forward to the new Star Wars films. I am a little sad about the apparently exclusion of Billy Dee Williams (Lando Calrissian). As a major Star Trek fan (way overtakes my love of Star Wars) I was worried about Abrams take on ST and while they’re too long, they’ve grown on me. I worry about the Disney aspect, but I like the first couple Pirates movies, so…here’s hoping. Thanks for dropping by. 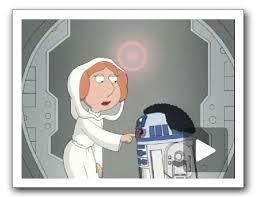 Loved them all – I have the perfect Darth Vader voice; use it rarely but its fun. Thanks for the historical post on Star Wars. Too too funny! Your sense of humor is incredible! 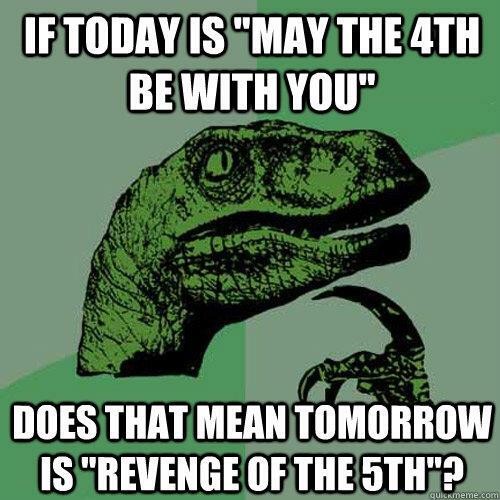 Revenge of the 5th…hahahaha! !